Flying When Kitesail Freebooter enters the battlefield, target opponent reveals his or her hand. You choose a noncreature, nonland card from it. Exile that card until Kitesail Freebooter leaves the battlefield. 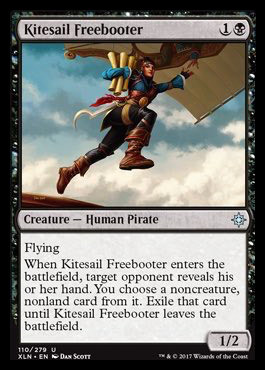 Flying When Kitesail Freebooter enters the battlefield, target opponent reveals his or her hand. You choose a noncreature, nonland card from it. Exile that card until Kitesail Freebooter leaves the battlefield. Connectez-vous pour ajouter Kitesail Freebooter à votre collection de cartes MTG.